With a landscape largely shaped by glaciers over the last ice age, the Scandinavian Peninsula is as picturesque in the winter as it is cold. Scandinavia (Danish/Swedish: Skandinavien; Norwegian/Faroese/Finnish: Skandinavia; Icelandic: Skandinavía; Sami: Skadesi-suolu, Skađsuâl) is a region in Northern Europe with several definitions. In a cultural, ethno-linguistic sense, Scandinavia comprises the North Germanic-speaking countries, which are Norway, Sweden, Denmark, the Faroe Islands and Iceland. Those countries share a partly common history, including political, linguistic, and cultural ties. The North Germanic languages of those countries are Norwegian, Swedish, Danish, Faroese and Icelandic. Strictly speaking, in physical geography, Scandinavia refers to the Scandinavian Peninsula. 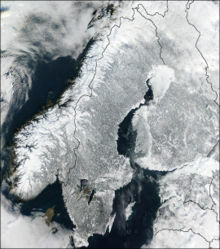 The Scandinavian Peninsula consists of Norway and Sweden (and even northern Finland and far northwestern Russia). The peninsula is approximately 1,850 kilometers (1,150 miles) from the southernmost to the southernmost point, and between approximately 370–805 km (230-500 miles) from east to west. But Scandinavia is often used to mean the three nations of Norway, Sweden, and Denmark. In the broadest sense, Scandinavia is a synonym of the Nordic Countries, which comprise Norway, Sweden, Denmark, the Faroe Islands, Iceland and Finland. However, Finland has a quite differing culture, since Finnish belongs to the Finno-Ugric languages, not to the Germanic languages. Sami, the minority language of northern Norway, northern Sweden, northern Finland and far northwestern Russia, is also a Finno-Ugric language. This page was last modified 20:57, 7 October 2010.